The former vice president of research for GM outlines how robotic driving technology will entirely reshape transportation. Autonomous vehicle technology is advancing rapidly, and hard-core promoters contend that driverless cars could soon be the norm rather than the exception. Many other knowledgeable analysts, however, say widespread adoption of fully autonomous cars is many years — perhaps decades — away. The chief reason for the delay is the years it will take to generate the vast amount of data required to make self-driving cars fully safe. But whenever it finally takes over, driverless technology will do much more than ease daily commutes: It will also have a profound impact on the world’s economy, notes Lawrence Burns, a former corporate vice president of research, development and planning for General Motors who supervised and encouraged GM’s development of robotic driving technology. 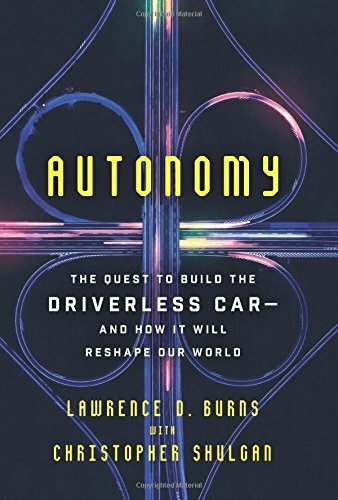 His new book with Christopher Shulgan is titled, Autonomy: The Quest to Build the Driverless Car — And How It Will Reshape Our World. He joined the Knowledge@Wharton show on SiriusXM to talk about how a driverless world will map out. Knowledge@Wharton: You were involved in one of the first funded projects on autonomous vehicles for the U.S. Defense Advanced Research Projects Agency (DARPA). Can you tell us about that? Lawrence Burns: After 9/11, DARPA was very interested in developing a vehicle that the military could use to keep soldiers out of harm’s way. You’ll recall when the Afghanistan and Iraq wars started, we had tragedies with our soldiers with these improvised explosive devices, so one idea was to create a robotic car that could do missions in city settings and not have to have personnel in them. So, they created a competition. The first races were across the desert out West, and then they did what was called the DARPA Urban Challenge in 2007. Eighty-five teams entered that race, and there was a $2 million first prize. I was at General Motors at that time, and we sponsored Carnegie Mellon University. Volkswagen sponsored Stanford. Our team was fortunate enough to win, but the real winner was the technology. We hit a critical proof-of-concept point that maybe we really could create cars that could drive themselves. Knowledge@Wharton: Many people think of this technology as something that has been around for five years or so, but it has been in the works for quite some time, correct? Burns: If you really go back in history, there were many visionaries in the 1970s and 1980s who thought we could have cars drive themselves by putting magnets in the road, and the car would follow these magnets. The problem with that was it required a lot of investment in the roads. Along came GPS, and Moore’s Law (that the processing power of computers will double every two years and costs would decrease) continued to play out, so we had greater computing capacity and better communications technology. We began to envision that you could do this just by making the car really smart and having it connected via GPS to satellites and big databases. That made the task really viable from our perspective. We began thinking about that around 2000, then DARPA did their challenges initially in 2004. So yes, we’ve been working on this pretty hard for 20-something years. Knowledge@Wharton: How close are we to seeing autonomous vehicles on the roads? Burns: Very close. I’m an adviser to Google self-driving cars, which is now their spin-off, Waymo. They have a fleet of several hundred vehicles operating in Chandler, Ariz., which is near Phoenix. They have several hundred early-adopter customers who are riding in these vehicles. Right now, there’s a Waymo personnel in the vehicle to be a backup in case something occurs. They’re getting really close. But “really close” isn’t good enough because we drive 3 trillion miles a year as Americans, so you need to be like 99.99% certain that you’ve captured all of the driving challenges. But we’re way out on that 99.99% world right now, trying to find those last few things and getting them right. Knowledge@Wharton: From the legislative side, how close do you think we are? Burns: The good news is so far the states, localities and federal government have been very proactive in the sense of realizing that, to get this perfected, you have to learn on public roads. You’re not going to prove this out in a laboratory or proving ground. You have to get it out on public roads — and they’ve found their way, working with the leading companies developing the technology, to let us learn on public roads. This is really a learning process, and the legislation and the regulations are continuing to progress. I think as long as the industry stays open to sharing their experience and what they’re learning and their data, and the governments stay open to the huge societal benefits that’ll be realized when we get to the full potential of self-driving cars, we’ll continue to make progress. Knowledge@Wharton: Is there more action now at the state and local level than the federal? Burns: That’s correct. California has allowed Waymo to do its development work in Mountain View. Waymo has done development work in Washington, and Texas and Arizona. The states have been quite proactive. The real question is, should we have different regulations from different states? I think the preference would be to have one national, base set of regulations so that we don’t have these variations across states. If you live in Michigan and you’re in a self-driving car and you’re going to Indiana, you want to make sure that you’re legally operating in Indiana. I believe all of the right discussions are going on. There is legislation that has been proposed called the AV START Act that’s being discussed in the Senate right now. That’s how our processes work — get to a starting point, have the dialogue, and hopefully it’ll land in the right spot. Knowledge@Wharton: You talk about the savings from the use of autonomous vehicles. In what areas and by how much? Burns: There are a lot of different ways autonomous vehicles can be used to benefit society. We’ve had a 130-year-old transportation system evolve over that century-plus timeframe. It has become safer and cleaner and more affordable, but there are 1.3 million people dying on the world’s roadways. That’s epidemic in scale. We’re over 90% dependent on oil. We’ve got the climate change issues. And there are a lot of hassles to owning and operating a car. For the first time, we have a chance to do something about that. When suddenly you can envision a car that doesn’t need a driver, it’s going to impact goods movement, the big trucks or the local package delivery to your home or your apartment. It’s going to impact how you get around every day. It’s going to let younger people get around more. It’s going to let older people get around more, and handicapped people, and people who can’t afford a car or elect not to own one. The benefits are tremendous. We see better experiences — door-to-door travel where you don’t spend your time traveling, getting out of the car feeling better than when you got into it — at lower cost in terms of your out-of-pocket and time cost and [the cost] for society. That’s what’s so exciting. I would say that any vehicle that moves on the surface on the Earth and has a driver could be transformed by what we’re talking about. Knowledge@Wharton: How will it change the trucking industry? Burns: When you look at an over-the-road tractor, ask yourself: What parts are on that tractor because there’s a driver in it? The windshield, the doors, the seats, the steering controls, the brakes — you begin to get the picture. In fact, the parts you can take off of that tractor will likely cost more than the parts you’re going to add to make it autonomous. Today, an over-the-road truck driver makes about 64 cents a mile in wage and benefits. There’s a shortage of drivers because it’s a tedious job. It’s one that takes people away from home. And there are safety concerns. Trucking is so important in an e-commerce world; every e-commerce retailer is competing to get you your package within a day. Now you have this huge productivity opportunity and safety opportunity with over-the-road trucking, and it’s going to be a very significant impact. Knowledge@Wharton: When you look at the partnerships that are being developed, what does that say about the auto industry moving forward? It almost feels like the auto industry knows that if they are not involved in this with a partnership or in some other way, they are going to be left out in the cold. Burns: Absolutely. I’d say one of the fascinating parts about my book Autonomy is that it tells that story. After this DARPA Urban Challenge, the only company that really stepped up for public road use application of this was Google. Larry Page and Sergey Brin challenged a small team of the participants in that DARPA challenge to come up with a vehicle that could go on public roads and prove the concept out. The auto industry was in denial for five or six years. We re-create that in Autonomy. We tell the story of how Google got started into this area, and then how some of the engineers on Google’s team reached out to the auto industry and had the door slammed in their face. Eventually, the auto industry began to get it in 2014-2015. Companies like GM and Ford and others have now moved into this space with their own driverless vehicle development programs. But think about what the auto industry has been. They sell the vehicle as a product, and the big opportunity here is to sell transportation as a service. It’s an entirely different business model, and the auto industry is going to have to learn how to participate in that business in addition to what they’ve done historically. Knowledge@Wharton: There have been some unfortunate accidents with driverless vehicles because of the developing technology. Do you think these issues will be worked out? Burns: Yes, that’s what engineers do. Engineers take what’s possible, and they make it real. The way you do that isn’t in one step. It’s done through cycles of learning. What I’m especially proud of in my Waymo affiliation is that Waymo has been on public roads now for more than 9 million miles, and they’ve had one at-fault crash. It was a two-miles-per-hour scraping of a bus. Yes, there have been some tragic fatalities with an Uber vehicle as well as a Tesla vehicle. My fundamental belief is if you follow best practices in developing the technology on public roads, you dramatically reduce the risk of these kinds of incidents. I can’t say with certainty that there won’t be additional crashes, but compare that to 40,000 Americans a year dying on our roads today. That’s over 100 a day. We’ve gone through similar challenges in developing vaccines. There are always some people who have a risk of an allergic reaction on a vaccine, but you’ve got to get it out there and you’ve got to get through the learning cycles and prove it out because the public benefit is so dramatic. Knowledge@Wharton: Can you talk about the environmental benefit of driverless technology? Burns: Yes, that was one of the real big “ah-has” for myself and the team I worked with. After I left General Motors, I ran a program at Columbia University’s Earth Institute called the Program for Sustainable Mobility. What we realized is that the path to electric vehicles and alternatives to oil for transportation energy is through autonomous vehicles. Once you have an autonomous vehicle, you can reposition vehicles when they’re empty so that you can be in a transportation service and not have the added labor cost of repositioning cars to pick up other passengers. Once you can do that, you want to reduce the cost per mile. You realize that the electricity cost per mile is 5 cents to 10 cents less than gasoline. If you have a vehicle that lasts 300,000 miles, that can be $15,000 to $30,000 savings over the life of the vehicle, which more than pays for the cost of the electric drive. Then you tailor-design them for the types of trips we make. Eighty percent of the trips Americans make in cars are one- and two-person, so why do we need four to six seats? And why do we need 3,000- to 4,000-pound vehicles to do that? Put all that together and you get the efficiency of lowering the weight of the car, the efficiency of electric drive, the savings per mile of electric drive, and you’re going to then re-energize at a depot, not at a corner station. Suddenly, you can introduce alternative fuels much more easily. This is a big breakthrough. My back-of-the-envelope calculations suggest we could reduce our dependence on oil for transportation by 80%, which really is one of the keys to the climate change solution. Knowledge@Wharton: That makes me wonder whether it will be a longer process in Washington, D.C., because there is a lot of money in the oil and gasoline industry, which carries influence with policymakers. Burns: Absolutely, and the jobs implications are significant. There are 4 million people in the United States who make their living as drivers. There are a lot of people who make their living in the oil and gas industry. In fact, the two states whose GDP has grown the most since the recession are North Dakota and Texas — oil states. The jobs implications are significant, but we’ve gone through these transitions in the nation’s economy before. When we went from an agricultural economy to an industrial economy, for example, a lot of farming jobs were displaced. But new jobs came along. This transition, I believe, is inevitable. I believe it’s sooner than most people are anticipating, but it’s not going to be like a light switch, where people can’t prepare themselves and transition to the new economy jobs. One of the reasons we wrote Autonomy was to [help] a mainstream audience … understand how the technology came to be and how it’s going to impact their life. Then they can judge for themselves whether they need to be preparing differently for the future. Knowledge@Wharton: What types of jobs will be created by autonomous vehicle industry? Burns: Certainly, all of the jobs associated with developing the technology. Some people think that you may even have concierge services on some of these alternative vehicles because you’re trying to provide a great ride to people. So, you may have a person on board who’s not the driver but is caring for the people who are riding in the vehicles. I think there are going to be some very interesting infrastructure changes. One of the advantages of having a driverless over-the-road truck is that the load doesn’t have to be as big. Part of the reason you have a big, heavy load is you’re trying to spread that cost of the driver over more pounds of shipment. I think we’re going to have opportunities that emerge and new forms of infrastructure beyond the communications infrastructure. Knowledge@Wharton: What about the productivity that you could potentially gain back by having autonomous vehicles? By not focusing on driving, people could be working while riding. Burns: That’s a great observation. Transportation has always been a driver of productivity and the nation’s growth over long timeframes. The interstate system was a major enabler of U.S. competitiveness on goods movement. There are productivity opportunities here for moving people and goods around, and the amount of time we’re going to allow people to free up in their daily lives. If you take the over 200 million drivers who have their own car in the U.S., we’re going to give them back those 90 minutes a day spent driving for productivity opportunities. A derivative reprise of old information. I particularly enjoyed the statement of “My back-of-the-envelope calculations suggest we could reduce our dependence on oil for transportation by 80%”. Stated many times for years. To this point, by far the best analysis is A RethinkX Sector Disruption Report May 2017 James Arbib & Tony Seba. Extremely detailed and substantiated, with absolutely no refutation to this date. It was after this report and further Waymo and Tesla success that we started seeing auto industry and oil execs begin to make dramatic public changes in their positions on autonomous driving and oil impact. Wharton, please up your game and publish some original, substantive analysis. “How Autonomous Vehicles Will Upend Transportation”? That is very narrow. With GM & Waymo exploring the idea of transportation as a service, yes transportation will be upended. With millions of driver jobs lost the labor market will be upended. How many insurance agents will be needed? One for GM & one for Waymo should be just about right. Most autonomous vehicles will be electric, so the petroleum & gas station markets will be upended. Electric cars need much less maintenance so most of the 3/4 of a million mechanic jobs and their employers are in for a downsizing and consolidation. If nobody owns a car, street parking may be eliminated along with a revenue stream for cities and two lanes may be repurposed. “Many other knowledgeable analysts, however, say widespread adoption of fully autonomous cars is many years — perhaps decades — away.” Do not tell Waymo who has promised service limited to 100 square miles starting in December 2018. If successful, Waymo has the ability to ramp up quickly. Waymo has ordered 62,000 electric minivans. You are just scratching the surface with this article. Couldn’t agree more. You may have already read this study, but to date it’s the best I’ve found: A RethinkX Sector Disruption Report May 2017 James Arbib & Tony Seba. The mass introduction of AV is taking place as SEMI AV and is taking place with traditional auto brands using internal combustion engines. The concept of full AV is an outlier. This has been propagated by over exuberant marketing hype and wishful thinking. Unless there are Government tax credit incentives the electric vehicle sales are sluggish. Of all the electric vehicles placed in service at least 80% are not purchased, instead they are leased. The cost of electricity is misleading. Most EV’s do not have access to garage charging. Electric purchased at non subsidized private charging stations is 75 cents or more. Do not forget the cost of battery consumption. These are just the hard reality, not to mention the time needed to recharge on the highway. Yes, Waymo said they have purchased 62,000 vehicles, to be delivered over the next 5 to 10 years, if ever. Autonomous vehicles will create enormous traffic problems when finally and really introduced. That is a reality Waymo does not talk about. An AV will sit a long time before it will ever enter an expressway. Think about that. An AV will follow speed limits, maintain safe vehicle separation. How will it decide to pass another vehicle. An AV will slow down every time it is passed. Soon all trailing vehicles pass until the AV is almost standing still. An AV will be forced off the road by manually operated vehicles crowding into their lane. Okay so developers can solve this problem. I say these problems cannot be solved, ever. This is why I am purchasing a mercedes with driver assist features that I can turn off and on. I will shut AV off when I am in a rush and will drive over the speed limit. On I-75 I will take over in tight traffic situations and and turn AV on when there is open road. I must be able to override the speed limit because even state patrol is driving 80 in a 70 mph speed limit. This is not hype, it is reality. If full AV vehicles ever come into widespread use the volume of traffic will increase enormously. The only real and lasting solution to roadway mobility is an infrastructure enabling far greater speed, eliminates all traffic delays, and maximizes use of roadway with frequent bumper to bumper platooning. An organization called CEETI published a study in 2007 sponsored by Texas A&M, Texas Dot, Texas Transportation Institute, US Dot, and Federal Highway Administration. This is the clearest statement of the problem and spelled out in full detail the exact specification of a transportation system that would meet their requirements for a complete mobility solution. At that time they also studied over 200 candidates and found all of them seriously lacking. The organization that originally proposed this study and actually provided funding for this study has veiled itself in secrecy. I did know their name but have lost it. Good luck trying to find this study.